I'm usually the one who starts these things... I torture a friend [who shall remain nameless - but you know who you are] with a song (Lollipop), drag her to a concert (Framing Hanley), she gives me the "what is so great about this guy look," and then she looks up the video on YouTube. Fast-forward 24 hours and my small interest becomes a huge obsession. As for me, I just don't usually take it to that "next level" but now I'm the one with the uber obsession. 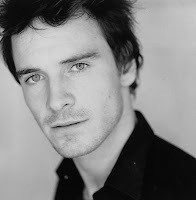 His name is Michael Fassbender - the German-born actor who grew up in Ireland. The obsessing began with "Inglorious Basterds" where I recognized him as another friend's eye candy (but now she won't admit it) from the film "300." In "Basterds," Michael plays the "adopted basterd" from the British Army who is supposed to help the American Basterds infiltrate a cinema full of the Nazi high command. "Basterds" began a huge weekend full of YouTube clips, rewatching "300," and updating my Blockbuster Online account with any movie containing Michael. For those who are thinking, "who is this guy?" In "300", he plays Stelios, a war loving Spartan with the best line in the movie (sorry Gerard!). okay, I'll admit I'm the first friend that shall remain nameless, but how can you blame me as Nixon is some serious cougar candy. And while I would love to add Michael to my obsession list... I'll let you take the lead on this one.